I always say that this is my favorite chart, so this month I am displaying it up here as the month’s top highlight. The chart shows how dividends received by the DGP have increased each year since the portfolio was started. 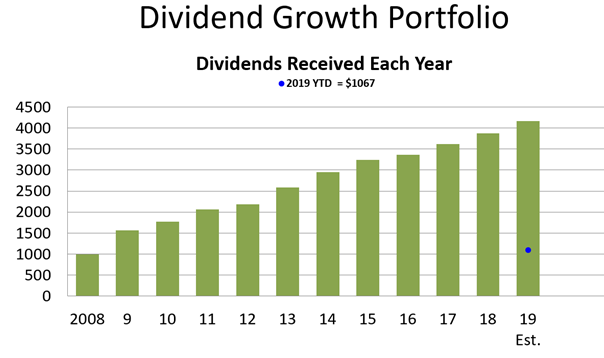 Right now, I estimate that 2019’s dividends will exceed 2018’s by about 8% by the end of the year, and I’m hoping for more than that. This table is sorted by highest-yielding to lowest-yielding stock. Received $427 in dividends from 12 companies. Current yield is 3.3%, down from 3.5% last month, due to portfolio’s market value increase. Yield on cost stayed at 8.8%. That’s the highest YOC ever recorded for this portfolio. There was no trading in March. The DGP received $427 in dividends from 12 companies. Fully half of the 24 companies in the DGP sent me money in March. Receipts ranged from a low of $13 from Smucker to $71 from PepsiCo. April is a slower month for dividends than March. I expect to receive $240 from 6 companies. The dollar variations from month to month simply result from the differing payment schedules of the companies that I own. The following table shows April’s expected dividend activity. All of these dividends have been declared by the respective companies. Per the portfolio’s investment policy, I allow incoming dividends to accumulate in cash until they reach $1000. Then I reinvest them. The next reinvestment will occur in May. This display shows how many dividend dollars are expected over the next 12 months. The annual run-rate is currently $4132. That is about 11% higher than at the same time last year. 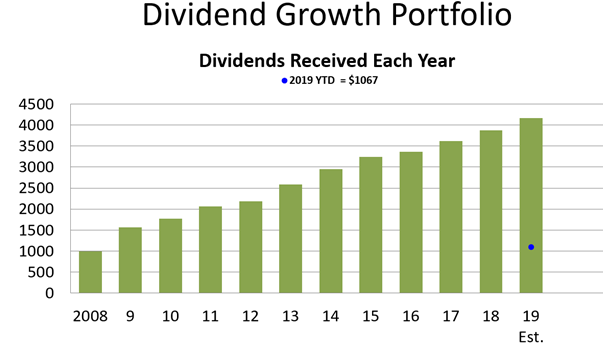 The projection, of course, does not include dividend increases yet to be announced this year, nor does it include dividends from shares that I will purchase when I reinvest dividends. So the actual 12-month dollar total should end up being more than shown. The projection is based on current payout rates and shares held. Last year, the portfolio got 28 increases and no cuts. This year, 14 increases have already been declared, including one in March. There have been no cuts. 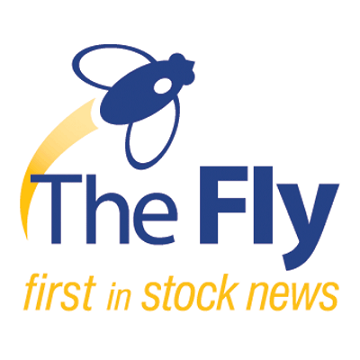 An additional 14 increases are expected by the end of the year, not counting any increases from new stocks that will be purchased. 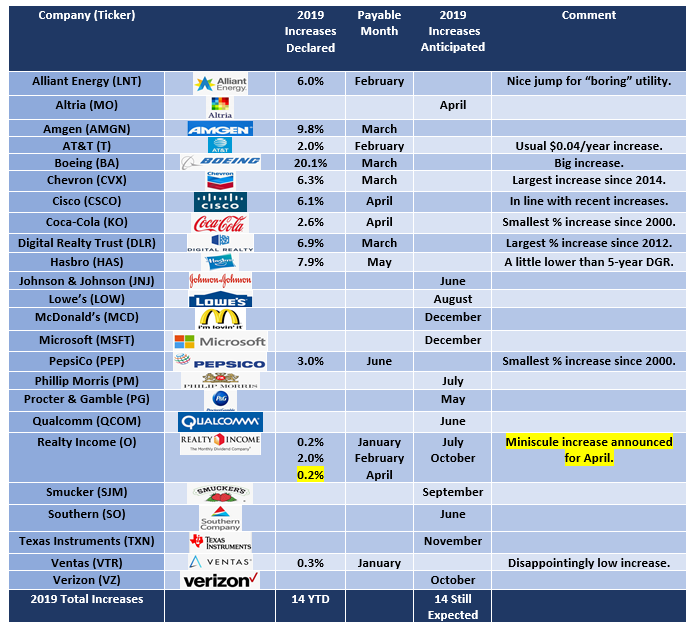 The table below shows the full calendar of dividend increases expected in 2019. March’s single announced increase is highlighted. Yield on cost is the portfolio’s yield calculated as a percentage of the original money invested when I started the portfolio in 2008. YOC is a backward-looking metric that shows what has been achieved so far. It’s like the scoreboard in a football game: It shows what the score is, based on events that have already happened. 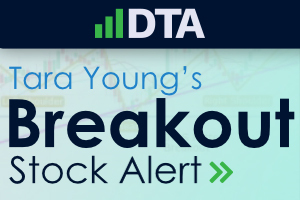 With just one tiny dividend increase announced in March, and no new stocks purchased, the portfolio’s YOC stayed the same as last month. What YOC means is that the DGP is now returning 8.8% of the original investment annually in cash dividends. That kind of income-generating power was the original inspiration for the portfolio more than 10 years ago. Current yield is the portfolio’s yield calculated as a percentage of the current value of the portfolio. That is down 0.2% from last month. The reason for the drop is that the market value of the portfolio increased by 3.6% in March. The new higher value is the denominator in the above equation, which forced the yield percentage down. Current yield is a forward-looking metric that forecasts what the percentage payout will be in the next 12 months, assuming that no dividends are increased or cut. Of course, with dividend-growth stocks, it is expected that the actual dollars collected in the next 12 months will be more than the current forecast. As discussed earlier, I am still looking forward to 14 more dividend increases this year. Prior to this month, the DGP’s current yield has ranged from 3.4% to 4.2%. This month’s 3.3% is the first time I remember the current yield dropping that low. But current yield is due as much to the vagaries of the market as to the rising dividend stream of the portfolio. Over the long haul, variations in current yield within the DGP’s normal range are not very meaningful. 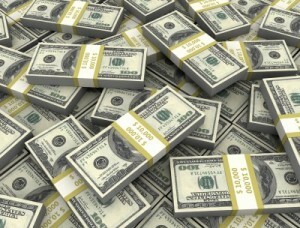 What’s important is that the income measured in dollars goes up steadily. As described in DGI Lesson 10: Two Ways to Reinvest Your Dividends to Enhance Your Returns, dividends can be reinvested either by dripping them or by letting them pile up in cash and then making larger targeted purchases. As described in the portfolio’s Business Plan, I use the second method in the DGP. I reinvest dividends when they accumulate to $1000. So far this year, I have made one such reinvestment. In February, I added to the stake in Verizon (VZ). For a more complete discussion of that purchase, see this article. I expect to make 4 reinvestments in 2019, same as last year. 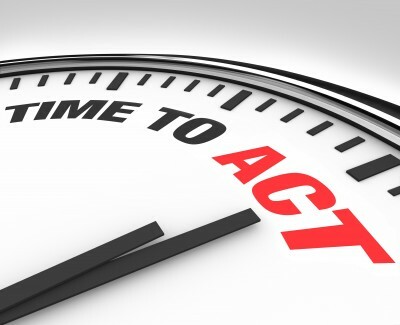 At the rate dividends are coming in, the next reinvestment should happen in May. Here’s my favorite chart. It’s the same one you saw at the beginning of this report. The whole idea behind the DGP is to generate a steady stream of growing dividends over many years. That’s exactly what has been accomplished and continues to happen, as the chart shows. The companies themselves announce regular dividend increases. Indeed, I pick companies for the likelihood that they will do that. I reinvest the dividends. The new shares then generate dividends themselves. Those cause the portfolio’s income stream to rise just as surely as a dividend increase would. Both factors occur without the need for additional outside money. It’s organic growth, generated by the portfolio itself. It does not need new contributions to fuel it. I have never added an additional dollar to the DGP since its inception. The companies themselves, of course, have added many dollars by sending me dividends. the additional dividends that will come from shares to be purchased via more dividend reinvestments in 2019. In a couple of months, I’ll add an estimate bar for 2020 to the chart, after I get a better fix on 2019. The value of the portfolio has grown 165% from its inception in June 2008. It started at $46,783. It is now worth $123,837. If the DGP’s original money had been invested in the S&P 500 Index via the tracking ETF called SPY, with dividends reinvested, it would have increased 153% to a total value of $118,361. That investment would be yielding only 1.9% compared to the DGP’s 3.3%. Total returns are only of secondary interest to me in the DGP. The primary goal is to build its dividend cashflow. I want high reliability plus a good balance between amount and growth rate. 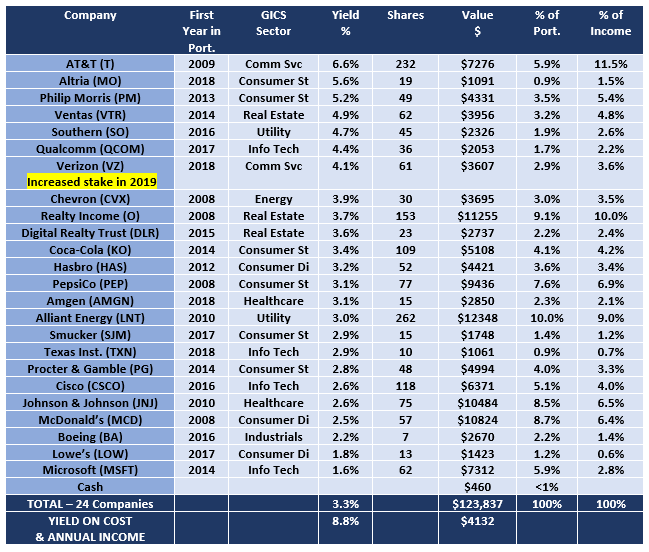 Background: What is the Dividend Growth Portfolio? 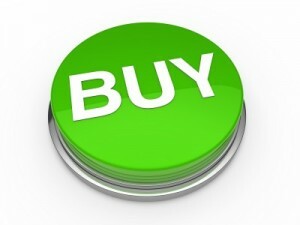 To see the Business Plan for this portfolio, click here. 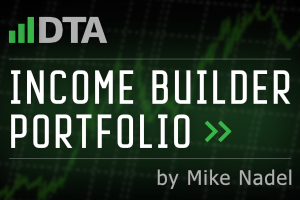 To learn more about the origins of the portfolio, click here. To see a list of all the articles about the DGP, see the section below. Remember, the DGP is not presented as best or a model. Rather, its purpose is to provide a live demonstration of what you can accomplish with dividend growth investing, and what it is like to run a real stock portfolio. I show what I do and explain why I do it. For a list of all of my articles about my portfolio, see below.